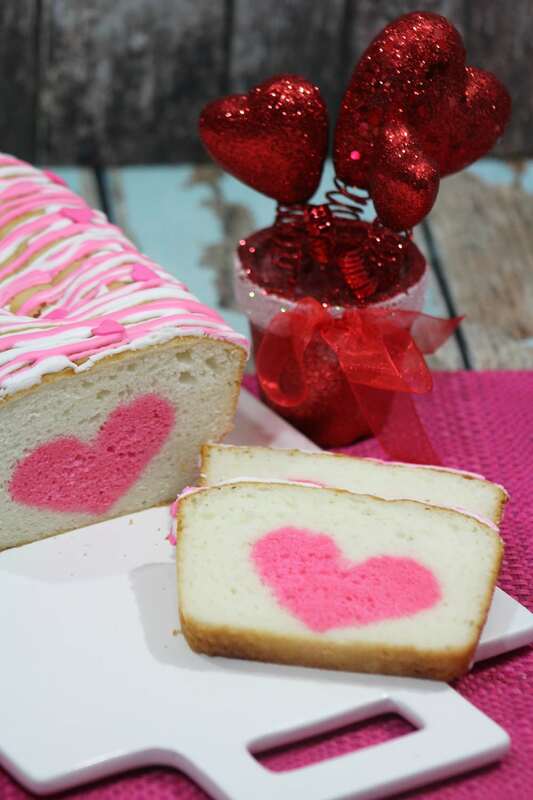 If you are looking for a Valentine’s Day dessert, then this Vanilla Strawberry Loaf Heart Cake Recipe is perfect for you. 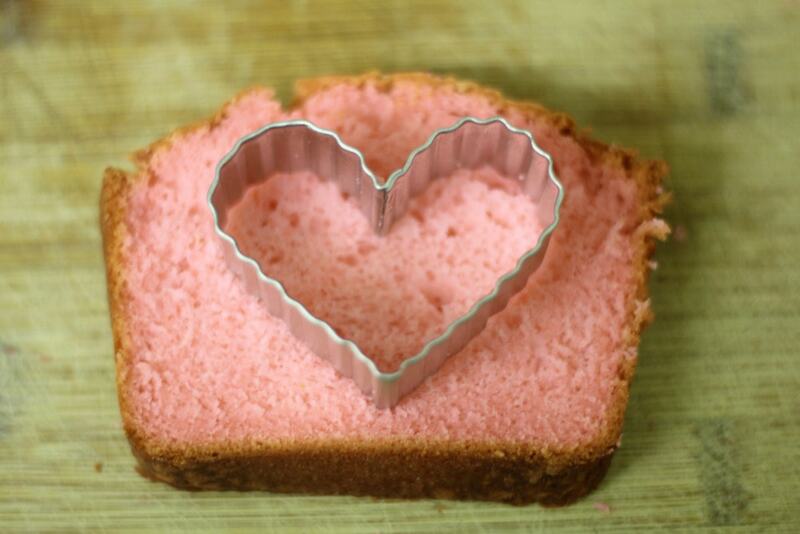 I just love the hidden heart that is hidden inside of this loaf cake! What a special way to show someone that you care – without having to spend a lot of money. The best gifts are the ones that you make from the heart and with a lot of thought and love, right? 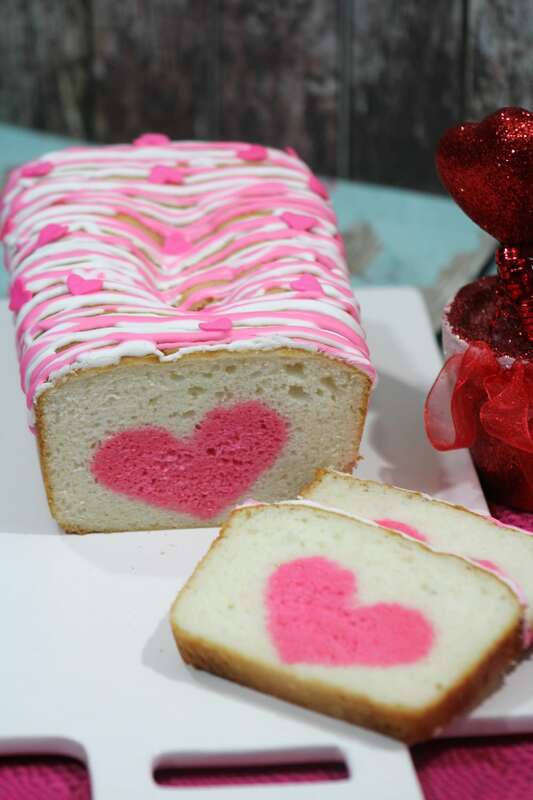 If you are looking for a Valentine’s Day dessert to wow your loved ones, this Valentine’s Day Heart Loaf is IT! -Preheat oven to 350 degrees. Prep a loaf pan with baking spray. -On high speed with an electric mixer beat butter and sugar until light and fluffy. -Beat after adding each of the eggs, one at a time. Add strawberry extract and salt. -Gradually add the flour beating on low until all ingredients are combined. -Add several drops of the pink gel food coloring. 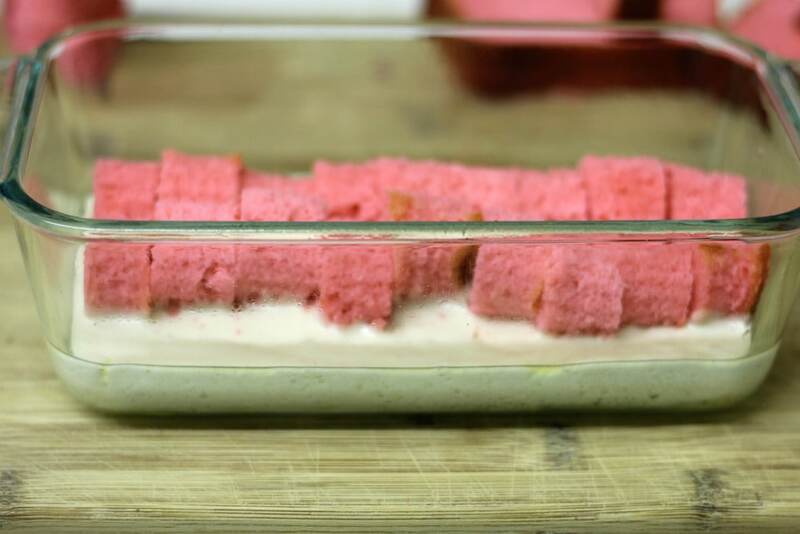 -Pour the pink batter into the loaf pan. -Bake at 350 degrees for about 50 minutes ( loaf will not be completely baked) . -Cool in pan 15 minutes. -Flip the loaf onto a wire rack to cool. -Turn upright to cool completely. -With the cookie cutter in hand measure for the width of each slice. -Cut each slice according to the above measurement. -Using the cookie cutter, cut out the hearts. Set aside. -Set each heart slice into the loaf pan (these should reach from one end of the loaf pan to the other end of the loaf pan). -On high speed with an electric mixer beat the butter and sugar until light and fluffy. -Beating after adding each of the eggs into the bowl, one at a time. Stir in the vanilla and salt. -Begin by filling in the batter on both sides and in between the heart slices and lastly cover the top of the heart as well with the batter. -Bake at 350 degrees for about 1 hour or until an inserted toothpick comes out clean. – Divide the icing evenly into two bowls. -In the first bowl of icing add several drops of pink gel food coloring. Mix well. 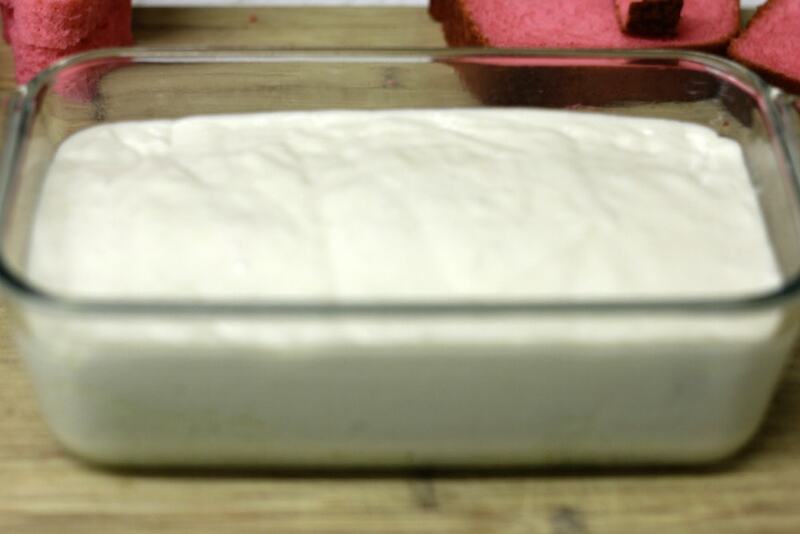 -Scoop the pink icing into a piping bag with a #2 tip. -In the second bowl this icing remains white. -Scoop the white icing into a piping bag with a #2 tip. 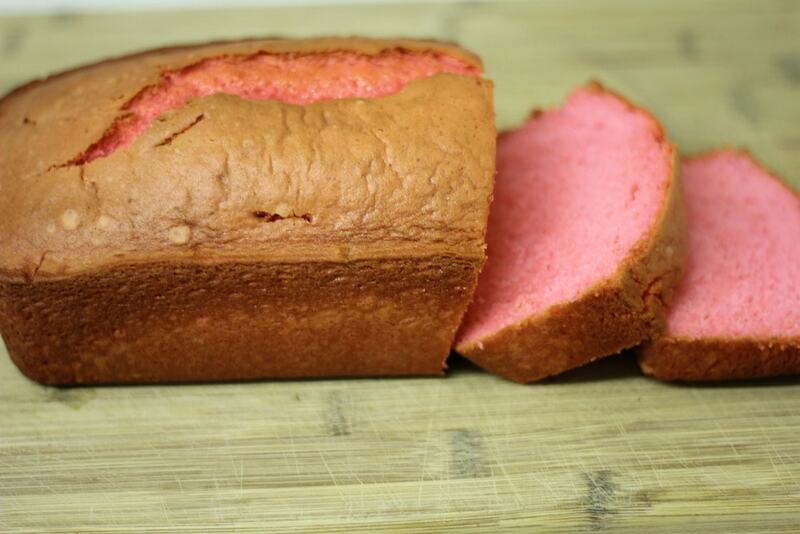 -Drizzle the pink and white icing on the top of the loaf cake. - Divide the icing evenly into two bowls.